From Bangladesh to Pakistan, Kyrgyzstan to Nigeria, Senegal to Turkey, it is not particularly rare in our own times for women in Muslim-majority countries to be appointed and elected to high offices—including heads of state. Nor has it ever been. Stretching back more than 14 centuries to the advent of Islam, women have held positions among many ruling elites, from malikas, or queens, to powerful advisors. Some ascended to rule in their own right; others rose as regents for incapacitated husbands or male successors yet too young for a throne. Some proved insightful administrators, courageous military commanders or both; others differed little from equally flawed male potentates who sowed the seeds of their own downfalls. of Muslim dynasties, empires and caliphates. The sixth and ﬁnal story in this series takes place in the early 16th century, when Morocco offered haven to Muslim and Jewish émigrés in the wake of the fall of Al-Andalus to Christian Spain. Ruler and defender of Morocco’s coastal city-state of Tétouan, Sayyida al-Hurra was a woman of many identities. Her name—really a title—loosely translates “an independent noble lady,” but to her detractors she was a “pirate queen.” Hasna Lebbady, author of Feminist Traditions in Andalusi-Moroccan Oral Narratives (Palgrave Macmillan, 2009), counts her among the Andalusi-Moroccan heroines who populate the nation’s history and folklore. Sayyida al-Hurra’s life was charted in large part by the crises of her era. These began most dramatically in 1492 with the expulsion of her family and fellow Muslim and Jewish countrymen from their beloved city of Granada in Al-Andalus (now southern Spain) by the forces of Ferdinand and Isabella. The event signaled the end of nearly eight centuries of Muslim rule in the Iberian Peninsula. Among the wave of refugees was qaid (tribal chief) Moulay Ali ibn Rashid, his wife, Lalla (Lady) Zohra Fernandez, a Christian convert to Islam, his son Moulay Ibrahim and his daughter—the future Sayyida al-Hurra, whose birth name was probably Aisha, and who was likely born sometime between 1485 and 1495. The Rashids were a noble clan that claimed descent from the Prophet Muhammad through Idrisi I, founder in the eighth century of Morocco’s first Islamic dynasty. Soon after the family’s exile from Al-Andalus, they settled in the Rif Mountains southeast of Tangier, where Moulay Ali founded and led the city-state of Chefchaouen, near Morocco’s northern coast. As a refugee himself, Moulay Ali opened Chefchaouen’s gates to waves of fellow Andalusis ﬂeeing the Spanish Reconquista. In 1510 she took her first steps towards fulﬁlling Oudjal’s prediction by marrying Abu Hassan al-Mandari, governor of Tétouan since 1505. Roughly 55 kilometers north of Chefchaouen, at the mouth of the Martil River, Tétouan was Morocco’s major port, an entrepot for goods from the interior and beyond. The fortiﬁed town was also a tactical base for maritime raids against the northern port of Ceuta, which at various times was held by rival Muslim (Nasrid) and Christian (Portuguese) powers. 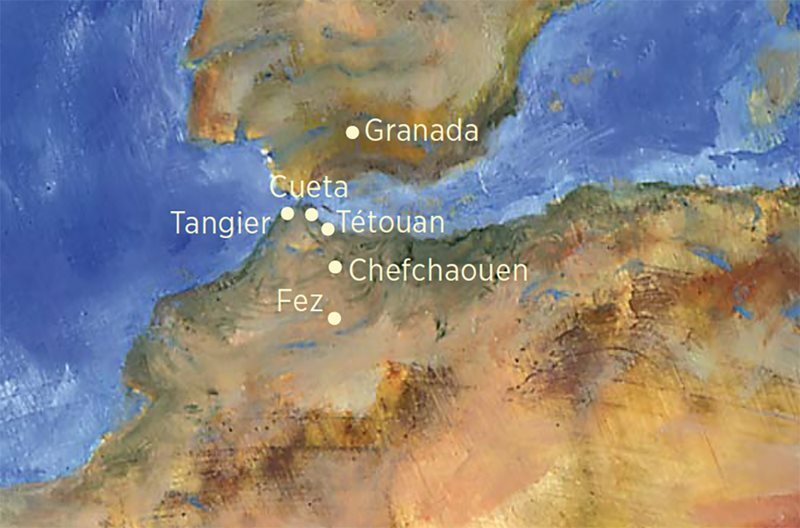 In 1400, fearing Tétouan’s position, the Portuguese had attacked it and left it in rubble. There is disagreement among historians over whether the man Aisha married was this particular Al-Mandari or another, younger member of the family of the same name who had succeeded him—perhaps a son (possibly Mohammad al-Mandari) or a nephew. In either case, her education, strength of character and presence of mind established her as a political leader, independent of male supervision, instruction or approval. The al-Mandari marriage alliance was a wise move. With Aisha serving as co-regent of Tétouan, and the concurrent appointment of her brother Moulay Ibrahim as vizier to Ahmed al-Wattasi, Sultan of Fez, the Rashids positioned themselves as major players in the effort to unify Morocco against the fast-growing powers of Spain and Portugal. The need for unity was genuine. In 1488 the Portuguese circumnavigated the southern tip of Africa and established their own direct sea route to Arabia, India and Southeast Asia. The gambit cut into the proﬁts of North African merchants who for centuries had acted as middlemen between Western Europe and Asia. The Portuguese also established colonies along the African coasts, linking them to the interior. At the same time, the Spanish, gazing hungrily across the Strait of Gibraltar and warily at Ottoman expansion in the Mediterranean, clung stubbornly to their own outposts along the North African coast: Tripoli, Algiers, Santa Cruz and others. Meanwhile, south of Fez, in what is now north-central Morocco, Ahmed al-Wattasi sought an alliance with Portugal to help him fend off rebellious Saadi tribesmen supported by England. The Mediterranean, once known as a Roman lake, had become an international and internecine stew. Al-Mandari, Aisha’s husband, died sometime between 1515 and 1519, and Aisha became Tétouan’s sole ruler. It was at this time she took on the formal title sayyida al-hurra, hakimat titwan—Sovereign Lady, Governor of Tétouan. (Europeans wondered if “Sayyida al-Hurra” was her actual name since it appears in contemporary Spanish records as Sida el-Horra; what seems most likely is that, unaware of her given name, they confused it with her title.) Nonetheless, as Sayyida al-Hurra, she effectively governed Tétouan for the next quarter-century or so, during which time “the city soon reached an unheard of level of prosperity,” as Spanish historian Germán Vázsquez Chamorro writes in his recent study, Mujeres Piratas (Women Pirates) (Edaf Antillas, 2004). Much of this prosperity derived from one obvious source: attacks on Spanish and Portuguese ships laden with goods, gold and other treasures. It was Sayyida al-Hurra’s association with the famed privateer Oruç Reis—known to the West as Barbarossa—that helped cement her “pirate queen” reputation. Born in Lesbos around 1474, Oruç and his older brother, Hayreddin, were among the most notorious of the so-called Barbary corsairs. As they moved their base around the Mediterranean as nominal servants of the Ottoman sultan, their exploits included raids on Spanish colonies, battles with Knights Hospitalers and even a daring attack on the (much larger) ﬂagship of Pope Julius II in 1504. A fearsome figure, Oruç sported a silver prosthetic arm. Despite the handicap, according to eyewitnesses, he “fought to the very last gasp, like a lion,” Yet he had a soft side: between 1504 and 1510, he helped transport Muslim refugees from Spain to North Africa. This earned him the affectionate nickname Baba Oruç (Father Oruç), which, to the European ear, was misheard as “Barbarossa,” which happened to mean “Redbeard” in Italian. In contrast, during the time of Sayidda al-Hurra, Morocco did not have a navy, and it depended on “privateers”—as Lebbady calls them—to defend the coast. As her power grew, so did her reputation. In 1541, during a whistle-stop tour through the region to help drum up support for his beleaguered dynasty, Ahmed al-Wattasi asked for her hand in marriage. She accepted, but refused to travel to Fez for the wedding, insisting instead that it take place in Tétouan. It was the only time in Moroccan history that a sultan married outside the capital. News of the wedding traveled as far as Madrid, where it troubled Philip II and was viewed by some as the Muslim equivalent of the power marriage between Ferdinand of Aragon and Isabella of Castile. But Sayyida al-Hurra’s power was not to endure. Her on-again-off-again diplomacy and spats with the Portuguese in Ceuta prompted its governor to cut off commercial ties with Tétouan, and local merchants grumbled that her temper and pride had become bad for business. Meanwhile, her son-in-law Moulay Ahmed al-Hassan al-Mandari (Abu Hassan’s grandson), anticipating the downfall of the Wattasids, allied with their tribal foes, the Saadis. He arrived in Tétouan in 1542 with a small army and usurped his mother-in-law. Accepting her fate, she retired to Chefchaouen, where she lived nearly 20 years more, until July 14, 1561. Worthy I am, by God of the highest, and Proudly I walk with head aloft. Art direction for the “Malika” series is by Ana Carreño Leyva. Calligraphy is by Soraya Syed. The logo graphics are produced by Mukhtar Sanders (www.inspiraldesign.com). Writer Tom Verde thanks Carlos Abellanossa, Betsy Raymond Stevenson, Rachel Sprouse, Leila Abouzeid and Sarah Al-Hamad for their assistance. He dedicates the six-episode Malika series to the late pioneer of Islamic women’s history Fatima Mernissi. Leonor Solans is an artist living in Granada, Spain.